Make vinaigrette: In a small bowl, whisk together balsamic, 2 tablespoons oil, honey, mustard, garlic, and red pepper flakes until combined. Set aside. In a large skillet over medium heat, heat remaining oil. Add chicken, season with salt and pepper, and sear until golden, about 3 minutes per side. Remove from pan and set aside. 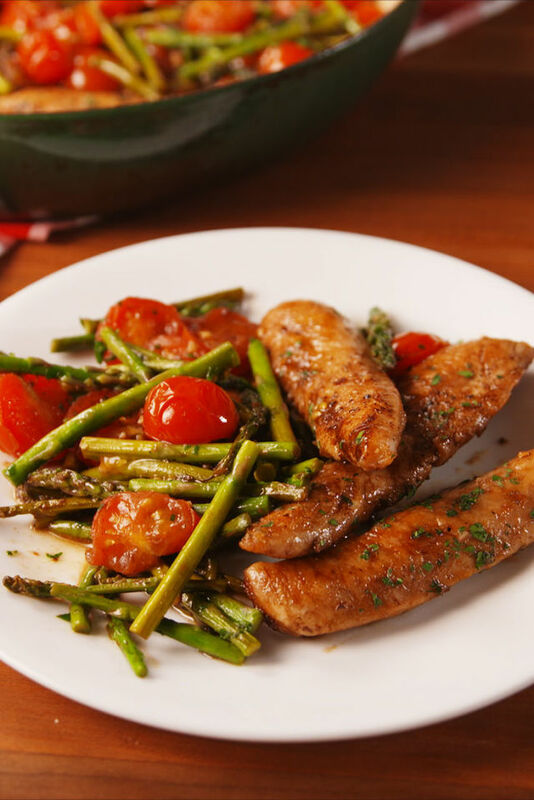 To pan, add asparagus and tomatoes, season with more salt and pepper, and cook until asparagus is bright green and tomatoes are slightly wilted, 5 minutes or so. Move veggies to one side, add chicken back in and pour in vinaigrette. Toss veggies and chicken slightly until chicken is cooked through and vinaigrette is thickened, 5 minutes more.